The acousto-optical Q-switch often used in the laser marking makes use of mutual interaction between an ultrasonic wave and a light beam in a scattering medium. The light beam that enters in a direction forming a Bragg angle to the wave surface of the acoustic wave in the scattering medium is diffracted in accordance with periodic changes in the diffraction rate produced by the acoustic wave. The situation is briefly explained. First of all, an RF signal is impressed to the transducer adhered to the molten quartz and thickness extensional vibration is produced. Ultrasonic shear waves are caused to advance in the molten quartz by this vibration, and phase grating formed by acoustic waves is produced. The laser beam is diffracted when it satisfies the Bragg angle with respect to this phase grating, and is separated in space from the incident light. If the laser optical resonator is constructed against 0-dimensional diffracted light (undiffracted light), the diffracted light deviates from the laser optical resonator axis when a RF signal is impressed. As a result, loss occurs in the laser optical resonator and laser oscillation is suppressed. To make use of this phenomenon, an RF signal is impressed for a certain length of time only (status of low Q-value) to suspend laser oscillation. In the meantime, the population inversion of the Nd:YAG rod is accumulated by continuous pumping. When the RF signal is reduced to zero (status of high Q-value) and the loss to the laser optical resonator is removed, the accumulated energy is activated as laser oscillation in a pulse form within an extremely short length of time. They are Q-switch pulses. This situation is briefly explained. When an RF signal is subjected to pulse modulation, it is possible to periodically take out a Q-switch pulse. When the period of Q-switch pulses becomes shorter than the life (about 200 ms) of the higher order of the Nd:YAG rod, however, the population inversion decreases and the peak value of Q-switch pulses decreases. A water-cooled acousto-optic Q-Switch for use in high-power Nd:YAG laser systems. Combining top grade fused silica with high quality optical finishing and in-house anti-reflection coatings, this Q-Switch exhibits very low insertion loss and high damage threshold. Through an innovative design and manufacturing process, RF powers up to 100W may be applied. 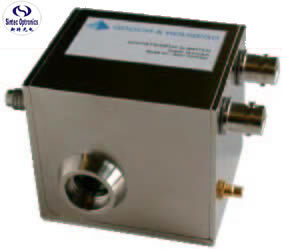 Standard options include a choice of frequencies (24 to 68MHz), active apertures (1 to 8mm), acoustic modes (compressional for linear polarisation, shear for unpolarised) and water connectors. Customised housings are available for OEM’s. Aperture : 1.6, 2, 3, 4, 5, 6·5, 8 - Value in mm (In general, the aperture of Q-switch is equal to or larger than the diameter of laser beam or YAG rod. Special Designation : - For non-standard Q-switch models identification characters which define the configuration may be allocated. < 1.2 1 at 50. A new compressional mode, water-cooled, AO Q-Switch designed for use in high power unpolarised lasers giving faster switching, better pulse-to-pulse stability and higher power densities. Enhance your systems performance with greater punch and increased power, specifically for laser processing applications. Before the Super Q-Switch, some customers were using 2 x Compressional mode Q-Switches (like the QS27-4C-S) in the same cavity. One of the Q-Switches is rotated 90degrees to the other. Because the Compressional mode Q-Switch is more efficient for polarised light, the first Q-Switch would block one polarisation & the second Q-Switch blocks the other. This is a good solution, but takes a large space in the cavity. The Super Q-Switch gives the same performance as using 2 x Compressional Q-Switch, but they are incorporated into 1 device. 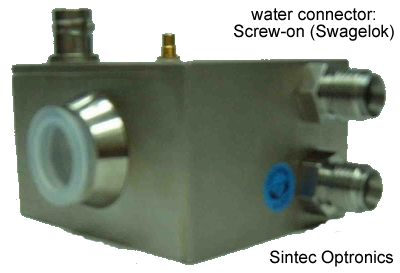 This Q-switch uses a dual channel driver to operate two orthogonal compressional mode transducers bonded to a single monolithic optical cell and mounted in one convenient housing. Our proprietary bonding techniques and power handling technology allows this device to operate up to 50W per channel giving an efficient, compact, single device for the next generation of high power, high gain, solid state lasers. A ‘Stallion’ version of our industry standard water cooled Acousto-optic Q-Switch, for use in high power lamp or diode pumped Nd:YAG lasers. The patent pending ‘Stallion’ manufacturing technique provides superior corrosion resistance whilst maintaining optimum performance and RF power handling capabilities up to 100W. Combining top grade fused silica with high quality optical finishing and in-house anti-reflection coatings, this Q-Switch exhibits very low insertion loss and high damage threshold. In addition to the standard product shown, custom configurations are available for specialized applications. These include alternative housing options, wavelengths and RF frequencies. 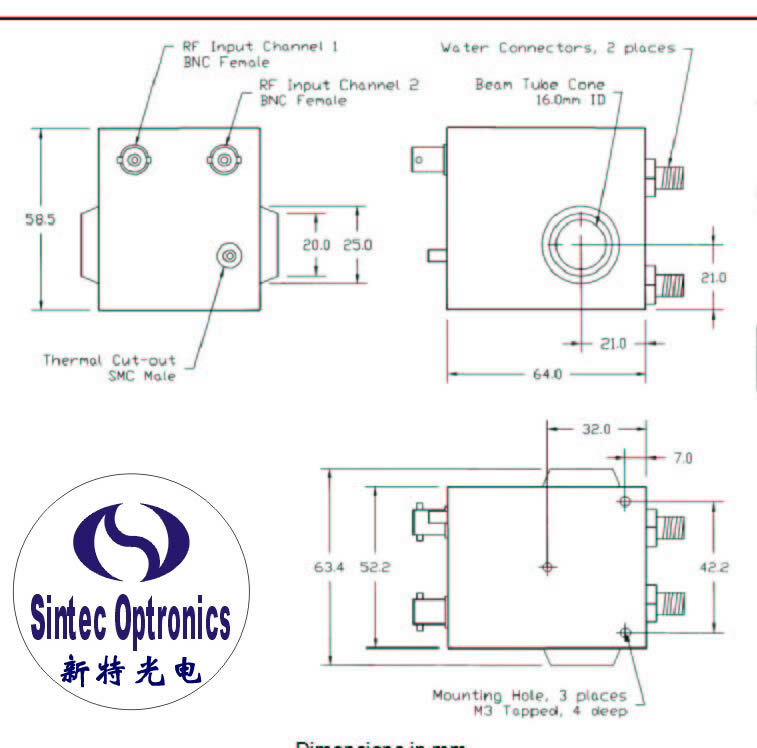 Example: I-QS027-4S4G-N5-ST1 (Q-Switch, 27.12MHz, 4mm active aperture, shear mode, fused silica, 1064nm, 4mm OD straight push fit water-connectors, BNC, Stallion housing with M3 mounting holes). The Q-Switches are for use in both industrial and laboratory applications. Q-Switching is used principally on high peak power solid state Nd:YAG lasers at 1.06 micrometer wavelength. 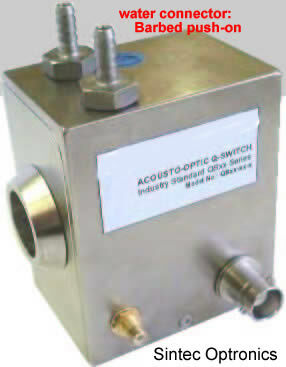 The Q-Switches are divided into three categories: for use with multi-mode, un-polarized lasers, with beam sizes 5mm and larger; for use with miniature, polarized or un-polarized, solid state diode pumped lasers; and single mode, polarized, low divergence solid state lasers, with beam size of 1 to 2 mm. Remark: EO Q-switches operating at 10.6um (CO2 lasers) available. 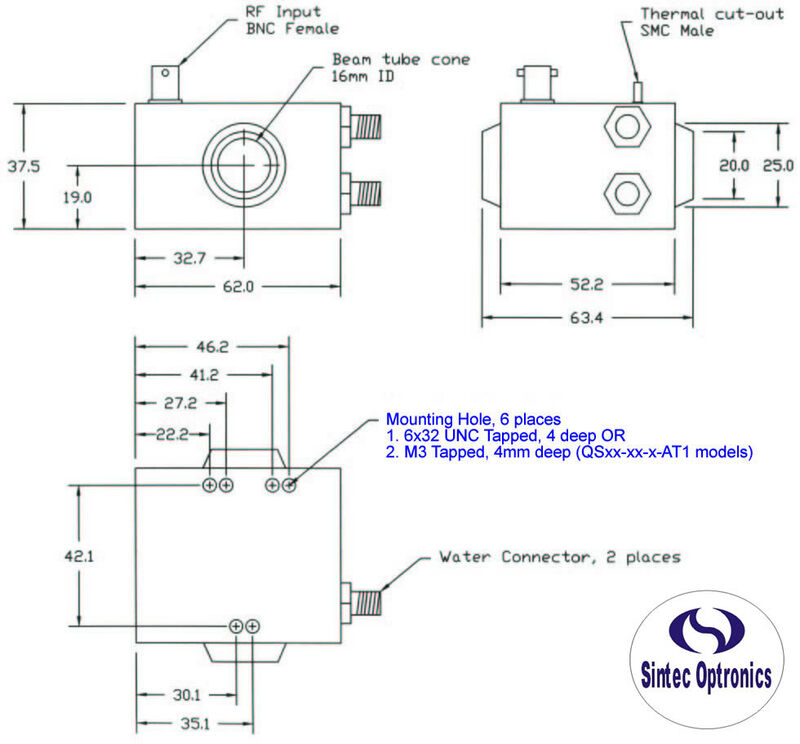 STBR series Acousto-Optic Q-switching systems for industrial and laboratory applications. The STBR free space Q-switches are designed for the highest conversion efficiency of RF energy into acoustic energy by attaching the transducer to the crystal with an advanced vacuum metallized process. 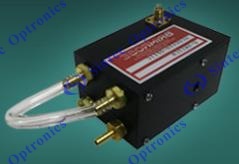 Q-switches are special modulators designed for use inside laser cavities. They are fabricated from high optical quality Fused Quartz, Flint Glass, and Tellurium Dioxide, or other acousto-optic materials with Brewster cut optical faces or durable hard oxide AR coatings for high optical power applications.